You can fine-tune your chat room monitoring by setting up topic feeds, or filters, that notify you of chat room messages that contain specific words and phrases you’re interested in. One topic feed, the “Ego filter,” is created automatically by Skype for Business persistent chat to capture and alert you about any messages that contain your name. Help you stay current in areas that involve or interest you without having to inspect every new message that gets posted to the rooms you’re following. Apply only to rooms that you follow (listed in the Chat Room view under the Followed tab). 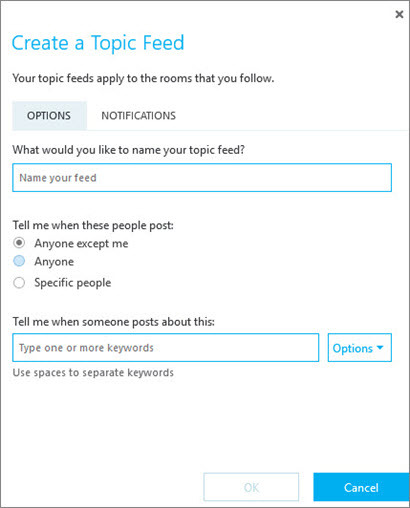 In the Skype for Business main window, on the Chat Rooms tab , choose Add a room > Create a New Topic Feed. Give your topic feed a name. Note: If you don’t assign the topic feed a name, it'll take the name of the search terms you assigned it. Tell Skype for Business whose posts you want to follow, provide keywords to narrow the content you want to monitor, and then choose OK. There are many possibilities available to you for topic feeds. You might want to create topic feeds for people whose communications are important to you—for example, create one that uses your boss’s name as a keyword. You also can create a feed about topics you’re working on that are of interest to colleagues or that you want to solicit feedback about. Or, choose a term (word or acronym) that you’ll use in messages that your colleagues might want to read, and ask them to set up a topic feed for that term.